Takeaway: At some point growing up means finding meaning and joy in work and yourself. 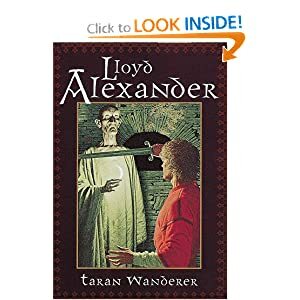 Taran Wander is probably my favorite book of the series. In many ways it is different from the rest of the series. Is it still a book focused on a quest, but instead of saving someone, defeating an enemy or finding a magical device, it is about Taran finding his heritage. As a young teen (probably really a tween) there are several points in the books where I actually learned something that I used later. Taran is wandering through Prydain to seek out his parentage because he wants to propose to Eliowayn. But she is a princess and he is an orphaned Assistant Pig Keeper. On his wanderings, he runs across many situations where he learns what is important. Early in the book he is rescued by a poor farmer that is proud of his small plot and the work of his hand. Later two Lords are fighting over their herds and the warriors end up destroying the land of that same poor farmer. Because Taran is friends with the King over the two Lord, and he has just saved the King’s life, Taran asks to sit in judgement over the two Lords. Instead of putting the two Lord in the dungeon, Taran orders them to work side by side with the farmer to restore the farm. Then because the two herds have been mixed together in the fight, he has one Lord divide the herds, and the other gets to choose which herd he wants. Then the prize cow that both want, is given to the Farmer as recompense, but the calves will be divided between each Lord as they come. This is not a great wisdom, it is basically a lesson in restitution and Solomon’s bargain. But it was the first time I remember understanding it. I thought it was wise. And again, I wanted to be wise and good like Taran. Several times later in the book Taran comes to terms with his own weakness. This is part of growing up that rarely is apart of teen focused coming of age book, but is a very important part of growing up. We both cannot do it all (because we are not skilled and gifted in everything), and we are corrupted by sin. The word sin is never used, but Taran beats himself up over internal motivations, lack of honor and weakness (what he means is sin). But also Taran has to come to terms with the fact that his dreams for himself may not actually be what is best for himself. This is directly against the ‘you can do anything you put your mind to’ mantra that many parents repeat to their children. On the one hand, you want to be encouraging. But on the other hand, children need to be told that they cannot do anything. Some things you simply cannot do well. The other side of the coin that says God created you have gifts, says that you were not created with other gifts. Maybe it is because I am getting older and running up against my own weaknesses repeatedly. But I think this is a message that probably needs to be shared more often with young adults. This is the longest of the books, both in length and time passed inside the book. But it is this point where the series moves from coming of age, to accepting responsibility.